Let’s face it, everyone likes vegetables when they are accompanied by a delicious dip. 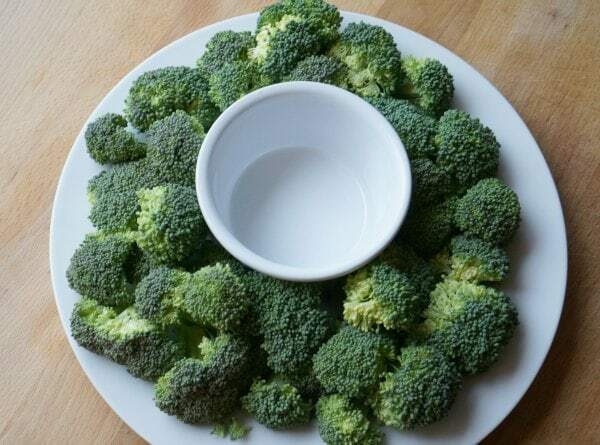 The easiest way to get kids to eat more broccoli is to provide them with something to dip it into. Right? If you are a parent you know this tip. 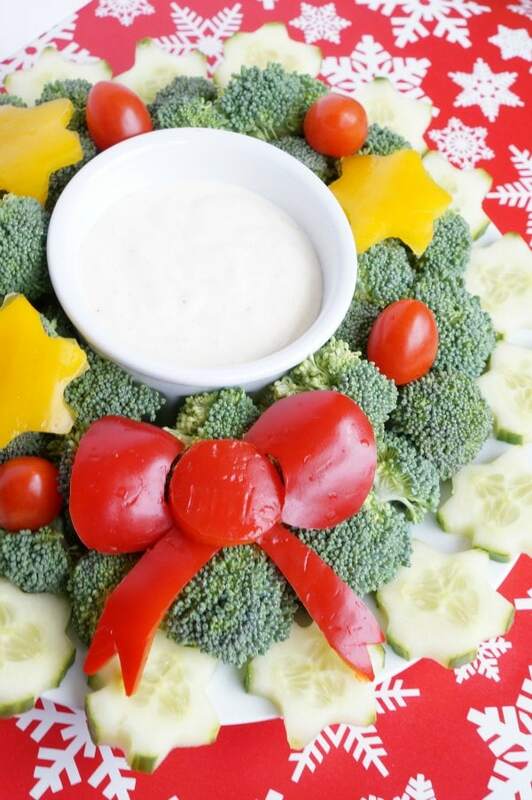 So, this holiday it is time to take the boring old veggie platter to the next level with a festive Christmas vegetable tray. 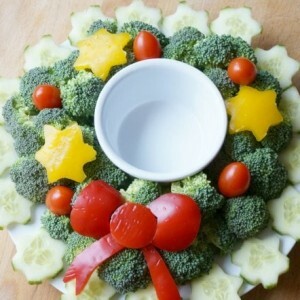 It is incredibly simple to transform a basic dinner plate into a holiday wreath – packed with vitamins and fibre. 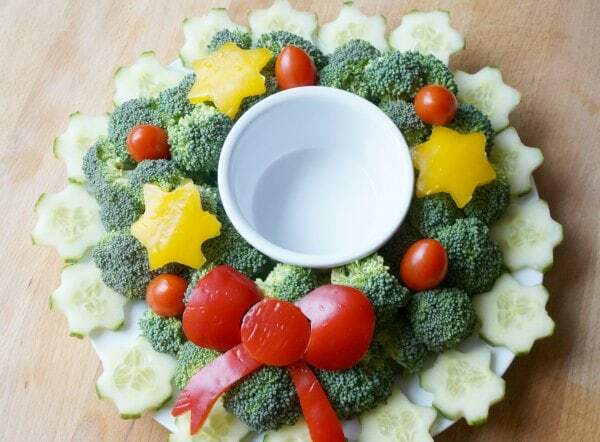 My daughter helped me put together this fun Christmas wreath vegetable tray. 1. Wash and dry all vegetables. 2. Prepare the dip by mixing together sour cream (or plain greek yogurt) with mayonnaise, thyme, dill, parsley, salt and pepper to taste. 3. Transfer to a resealable container and place in fridge for at least 2 hours. 4. Place the ramekin in the centre of a dinner plate. 5. Chop the broccoli and cauliflower down to small “trees”. Arrange the broccoli around the ramekin. This is the base of the wreath. 6. Cut the cherry tomatoes in half and place around the wreath – these are the Christmas balls. 7. Slice the peppers into thin strips. Place around the wreath – these are the ribbon. 8. Slice the cucumber into thin disks. Use a star shaped cookie cutter to create cucumber stars. Place around the wreath. Optional – Slice cheese into large thin slabs. 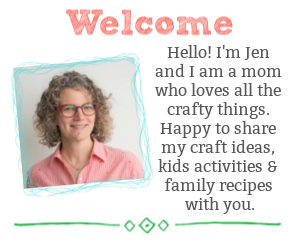 Use festive cookie cutters to make cookie cheese shapes – we used a gingerbread man and snowflakes. 9. Cover the entire wreath and place in fridge, until ready to serve. 10. When ready to serve, transfer the dip to the ramekin and enjoy. 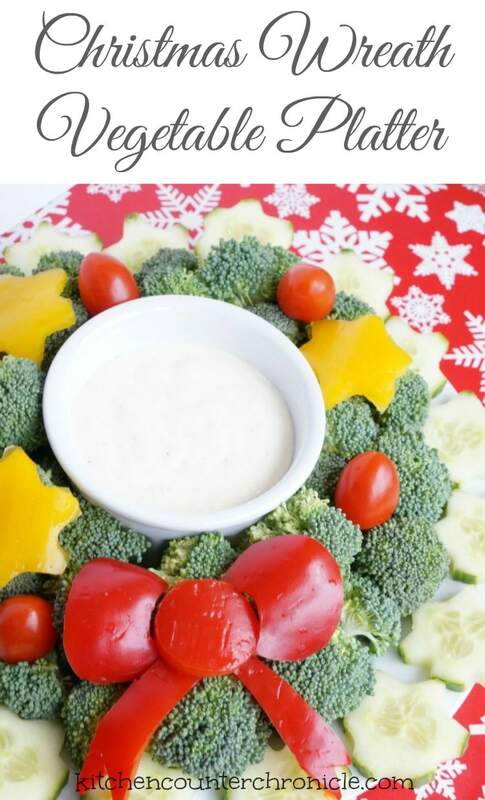 Everyone will eat all their veggies from this festive Christmas wreath vegetable platter and creamy dip. Wash and dry all vegetables. Prepare the dip by mixing together sour cream (or plain greek yogurt) with mayonnaise, thyme, dill, parsley, salt and pepper to taste. 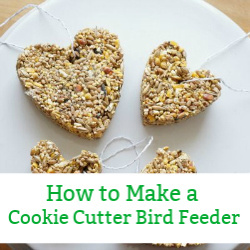 Transfer to a resealable container and place in fridge for at least 2 hours. Place the ramekin in the centre of a dinner plate. Chop the broccoli and cauliflower down to small “trees”. Arrange the broccoli around the ramekin. This is the base of the wreath. Cut the cherry tomatoes in half and place around the wreath – these are the Christmas balls. Slice the peppers into thin strips. Place around the wreath – these are the ribbon. Slice the cucumber into thin disks. Use a star shaped cookie cutter to create cucumber stars. Place around the wreath. 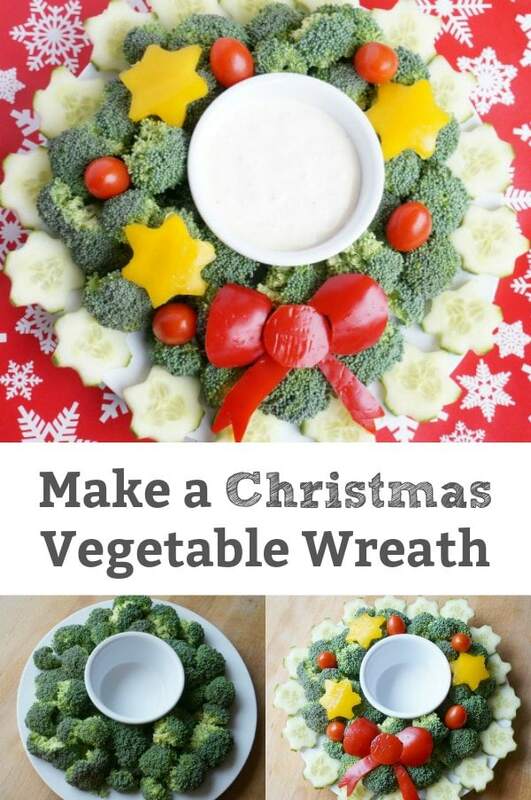 Cover the entire wreath and place in fridge, until ready to serve. 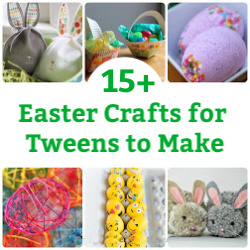 There are so many festive ways to arrange vegetables and cheese for the holiday. With a little preparation and planning the simple vegetable platter be a beautiful addition to the Christmas table. 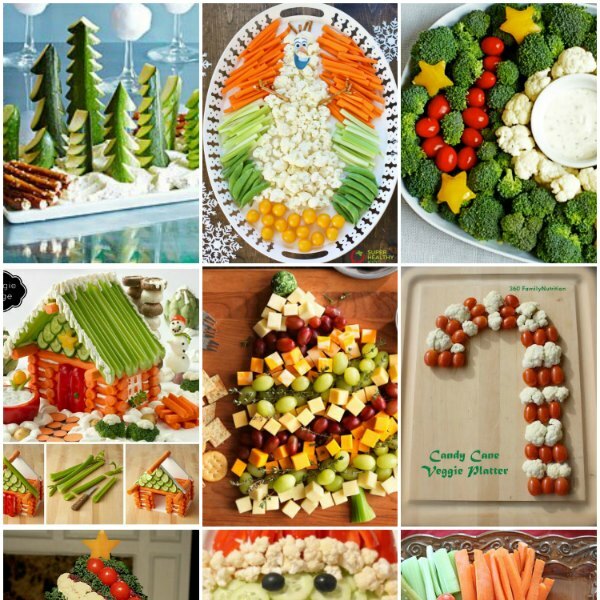 Check out our round up of 10 festive and fun Christmas vegetable platters…including a veggie Santa, trees and much more.